Namaste Fellow Fab Free Flower Children, and welcome back to the blog! Spring is officially here and the dollarbie Boho Hunt prize at Fukin’ Cute had me feeling like a free-spirit so I grabbed my guy Blue once again for a groovy adventure. It was a lot of fun teaming up with him again to try and capture the feeling of such an iconic time period. His tie-dye shirt, and Pru’s long skirt and halter top are both part of the same hunt prize at Fukin’ Cute. I hope you enjoy this 1 linden Boho Hunt gift as much as we did. His Tie-Dye Shirt – Nothing says “Free Spirit” more than tie dye if you ask me. This long-sleeve tee is the gift for the guys in the Boho Hunt prize at Fukin’ Cute. It comes in several mesh sizes, and includes an alpha layer making it suitable for classic avatars. To get your copy just look for the Boho Hunt object, a cute little llama, at Fukin’ Cute and purchase it for 1 linden. Her Skirt & Halter Top – Something about the green and white mandala-like pattern on this outfit by Fukin’ Cute just feels like spring. The outfit is the female part of the 1L Boho Hunt gift at Fukin’ Cute. With this outfit you’ll get the skirt and top in several sizes. I like the idea of being able to wear the top and skirt separately. All you have to do is find the Boho Hunt llama and purchase it for 1 linden to get your copy. Categories: classic avatar, dollarbie (1L-3L), Free, hunts, mens, mesh | Tags: $1 linden, 1 linden hunt, 1L, 1L hunt, Absoulte Creations Adam, Alantori, Alpa Layer Included, Angel DELUXE, Belleza Freya, Belleza Isis, Belleza Jake, Belleza Venus, BHB, bohemian, Boho, Boho Hnt SL, Boho Hunt, Boho Hunt Gift, Boho Hunt Prize, Catwa Dude, Catwa Koura, Classic Avatars, dollarbie, dollarbie hunt, Doux, Essences, fab free, Fab Free in SL, fabfree, fabfree in sl, fabulously free in SL, Feyline Fashions, Flower Child, free spirit, Fukin Cute, Fukin Cute Boho Hunt Gift, hippie, hunt SL, LODE, Lop, Lop Backdrop, Maitreya Lara, Male Hunt Prize, Men's Hunt Gift, Nardcotix, Nardcotix David, Niramyth Aesthetic, Project Puppet, Prudence Rexroth, Second Life, second life hunt, Signature Gianni, sl, Slink Hourglass, Slink Physique, standard mesh sizes, Stray Dog, The 60s, The Boho Hunt 2019, tie dye, TMP, Tonic Curvy, Tonic Fine | Permalink. Hello hello Fab Free’rs! It’s almost Valentine’s Day, so I thought why not show some mush and love on the blog. 😛 I’ve got my guy with me to help show this super sweet couples pose gift from the Pop Up Pose Fair and some matching his and hers hunt dollarbie prizes from the Love Me Not Hunt. Keep reading for all the important info. The Pose – The moment I saw this super fun couple’s pose by Fashiowl, I had to share it with you! It is one of 3 free gift poses at the Pop Up Pose Fair. It comes with the skateboard props, a mirrored version of the pose, and the pose is adjustable. To get your copy of this gift and the others by Fashiowl, you’ll need to join the Pose Fair group. It’s free to join. Then you can click the gift boxes at each of the participating vendors and get your free gifts. Also, the Pop Up Pose Fair ends Feb. 14th, so don’t wait! Waffles LMN Hunt Prizes – There are dollarbie his and hers hunt prizes for the Love Me Not Hunt at Waffles that are of course perfect for Valentine’s Day. The “Love Me” shirt for the guys comes in several sizes and is suitable for classic non-mesh avatars. The “Love Me” dress for the ladies at Waffles also comes in multiple sizes and will work for classic avatars. The LMN Hunt is a 1 linden hunt, so each prize is just 1 linden. The hunt item is a stem-less red rose. This hunt runs through the end of the month, so there’s still some time left to hunt the multiple floors at Waffles for these prizes. Categories: classic avatar, dollarbie (1L-3L), dress, events, fitted mesh, Free, group gifts, hunts, mens, mesh, other, poses, shirt | Tags: "7 Deadly S[K]ins", 1L, 1L hunt, Alpha Layer, Belleza Freya, Belleza Isis, Belleza Jake, Belleza Venus, BlueGreyEyeGentleman Resident, Catwa Dude, Catwa Koura, cheapie, Cheeky, Deadwool, dollarbie, dollarbie hunt, Dollarbie Hunt Prizes, dollarbies, eBody, Essences Vanya, fab free, Fab Free in SL, fabfree, fabfree in sl, fabulously free in SL, Fashiowl, Fashiowl Gift, Fashiowl Pop Up Pose Fair Gift, Fashiowl Poses, fitmesh, Fitted Mesh Size, free group gift, free group join, free pose, Free Pose Fair Gifts, Free Pose with Props, Fukin Cute, Hunt in SL, Ivory & Rose, LMN Hunt, LMNH, Love Me Not Hunt, Magika, Magika Please Group Gift, Maitreya Lara, Mary Cakes, Past Group Gift, Pop Up Pose Fair, Pop Up Pose Fair Gifts, Pose Fair, Pose Fair Gifts, Pose with Props, Prudence Rexroth, Reign, Second Life, second life hunt, Signature Geralt, Signature Gianni, Skateboard, Skateboard Love Pose, Skater, sl, sl dollarbie, SL Freebies, sl gifts, sl hunt, Slink Hourglass, Slink Physique, Slink Physique Male, standard mesh sizes, TMP, valentine's day, Vango, VDay, Vero Modero, Waffles female Hunt Prize, Waffles Hunt Prize, Waffles Male Hunt Prize, Waffles! | Permalink. I don’t know about y’all but I’m more than ready for the weekend! All the good Halloween parties are happening this weekend both in RL and on the Grid. Now I can’t help you with the RL parties but I think I’ve got you covered for the Grid Parties. I probably could have filled up a week or two of posts with just the Boo! at Blacklace Hunt. The prizes are just that great. So I had to pick just two favorites. You saw the lingerie, and here’s my dress-up fav. This is the “Shadows” gown from Tinroof. Tinroof has set out three gifts for the hunt: the gown, a crow for your shoulder and the lovely masquerade type mask I’m holding. (with it’s own hold animation) At first, I only wanted the mask but I also found the gown and as soon as I saw it, I feel in love. The fabric is just gorgeous and purple is my favorite color. Plus, it’s just slinky enough to be smexy without being … um, overly reveling. perfect for a masked ball, don’t you think? A quick P.S. – Love showed us this gorgeous ‘statement’ necklace here. It’s still available for FREE at FaMESHed! But don’t wait too long if you need it! Categories: accessories, all-in-one outfit, classic avatar, costumes, dress, formalwear, Free, hunts, jewelry, mesh, skirt, Uncategorized | Tags: 0L, belleza, Blacklace, Calico Hair, dress, eBody, Eudora 3D, fab free, Fab Free in SL, fabfree, fabfree in sl, fabulously free in SL, FaMESHed, fashion, free, free fashion sl, free in sl, free sl, freebie, freebies, freebies sl, gift, gifts, hunt, Ikon, Juli, Julianna Seriman, lelutka, Love Trill, maitreya, Maitreya Lara, Ocacin, pout!, Second Life, Second Life Free, Second Life Freebies, sl, sl free, SL Freebies, SLink, standard mesh sizes, Tinroof | Permalink. Hey There Fab Free’rs! I’m feeling a little fauny today… okay bad puns aside, I was totally inspired by the new Fabulously Free in SL group gift from PoshTale to create this fun faun look. I originally thought of the wood nymphs in the animated Disney movie “Hercules.” The “Pyria” tunic from PoshTale is a free group gift to all our Fabulously Free in SL group members. If you’re not a member, join! The group is free to join. This gift can be found to the right as you enter the PoshTale store. It comes in mesh sizes and has an alpha layer for Classic Avatars. Also, there is a color change hud with 10 solid color options for the tunic, and a choice of gold or silver for the side straps and fasteners. Categories: classic avatar, FabFree Group Gifts, fantasy, fetish, Free, gorean, group gifts, mesh | Tags: $0L, 0 linden, aisling, Alpha Layer, Catwa Koura, Essences, Fab Free GG, Fab Free in SL, fabfree, fabfree blog, fabfree in sl, fabulously free in SL, Fantasy Fashion, Fashion Blog, Fashion in SL, Faun, Fawn, female fashion, Focus Poses, Focus Poses Backdrop, Foxcity, FOXCITY Poses, free, Free Clothes in SL, free gift, Free Gift in SL, Free Gorean Fashion, free group join, free in sl, freebie, Freebie Blog, Freebie Fashion, Gauze, gor, gorean, Gorean Fashon, group gift, little bones, Maitreya Lara, Nymph, Posh Tale, PoshTale, PoshTale Fab Free Gift, Project Twilight, Prudence Rexroth, Role play, Roleplay, RP, Second Life, Seydr, Shiny Stuffs, sl, sl freebie, sl freebie blog, standard mesh sizes, Swallow, The Mesh Project, TMP | Permalink. Hi There Fab Free’rs! Does anyone else have random bouts of insomnia? I know I cannot be the only one! Despite being sleepy the next day I can’t be mad about staying up late, it lead me to find some cute gifts from Kuni and Pink Pearl Designs to share with you. Hair & Headband – How sweet is this sleek long hairstyle with the cute kitty-eared headband?! You can pick up this FREE group gift at Kuni. You will need to join the Kuni group, however it is FREE to join. This gift includes the hairstyle in 3 sizes, the kitty headband, a texture change hud for the headband, and 2 color huds for the hairstyle with tons of color options. Tank & Boy Briefs – The waistband of these boy brief style undies says it all! This tank and underwear combo is just cute. 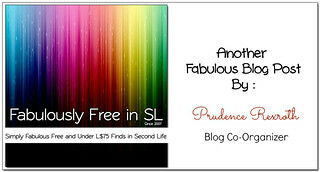 To get your copy of this FREE gift you’ll need to take a trip to Pink Pearl Designs. There you’ll see this gift offered to La Femme Fatale Designer group members. This group is FREE to join. Once you have your La Femme Fatale Designer group tag on you can click the little pink gift bag and your gift will be sent to you. The gift comes in several mesh sizes and though the gift is titled “Dark Dayz Fat Pack” mine only included a pastel color hud. I am sure this is just a mistake of some kind, but I was not bothered by it. After all it is still a FREE gift and it is very cute. **P.S. The cute sleepy pose I’m using for the photo in this post is part of a pack of “sleepy” static poses by YoGa that you can pick up for just 50 linden on the Marketplace! Categories: accessories, Free, group gifts, groups, hair, lingerie, Marketplace, mesh, pants, poses, shirt, sleepwear | Tags: Belleza Freya, Belleza Isis, Belleza Venus, Catwa Koura, Catwa Koura Bento, cute, fab free, Fab Free in SL, fabfree, fabfree in sl, fabulously free in SL, Fashion in SL, female fashion, free, Free Clothes in SL, free fashion, free gifts, free group gift, Free Group Gift Hair, Free Group Gifts, free group join, Free Hair, freebies, IR, Kitty Ears, Kitty Girl, Kitty Headband, Kuni, Kuni Group Gift, Kuni Hair, La Femme Fatale Designer Group, La Femme Fatale Designer Group Gift, neko, Patpack, Pink Pearl Designs, Pixy Snook, PPD, Prudence Rexroth, Second Life, Skin Fair, Skin Fair 2018, sl, Sleepy, Slink Hourglass, Slink Physique, Standard Mesh, standard mesh sizes, Stix, Stix Skins, Stix Xuxa, The Ivory Rose, The Ivory Rose Tattoos, The Mesh Project, TMP, YoGa, Yoga Poses | Permalink. Hi There Fab Free’rs! I’m back with some FREE men’s sunglasses from Heth Haute Couture and some FREE subscriber goodness from Graffitiwear. These are the sort of Freebies I live for. No groups needed and absolutely Fabulous! The Sunglasses – Technically yes, these FREE sunglasses from Heth Haute Couture are designed for the gentlemen in Second Life. However, they have resize scripts. I love these sunglasses, they would look great on anyone and the textures are fantastic. To get your pair, head over to Heth Haute Couture and purchase these glasses for zero linden. No group is required. The Crop Top – Graffitiwear recently sent out this loose cropped halter top to their Subscribers. It comes in several mesh sizes and has an alpha layer so Classic avatars can wear this FREE gift also. There is also a texture change hud with 4 total options, a butterfly/floral pattern, 2 feather-like patterns, and the comic book/pop art version Pru is wearing. To get your copy, join the Subscriber at Graffitiwear, then click the gift vendor if it is not automatically sent to you when you subscribe. Categories: accessories, classic avatar, fitted mesh, Free, mens, mesh, shirt, subscribe-o-matic, unisex | Tags: (RED)MINT, aisling, aisling horns, Catwa Koura, fab free, Fab Free in SL, Fab Free inSL, fabfree, fabfree in sl, fabulously free in SL, Fashion Freebie, female fashion, free, Free Clothes in SL, free fashion, free gifts, free in sl, free subscriber gift, freebies, Graffiti Wear, Graffitiwear, Graffitiwear Subscriber gift, Heth Haute Couture Free Gift, Letis Tattoo, little bones, Maitreya Lara, Prudence Rexroth, Red Mint, Second Life, sl, SL Freebies, standard mesh sizes, Subscriber Gift, sunglasses, The Skinnery, The Skinnery Maddie, Virtual Fashion | Permalink. Hi Again Fab Free’rs! I’m excited to share more of my finds from the Cart Sale going on at The Wash. Aside from the obvious allure of completely affordable prices, a big draw to the Cart Sales put on at The Wash for me is the opportunity to try out shops I’m not super familiar with. One such shop is Dark Water Designs. Along with some very cute casual ladies clothing, they had some casual menswear at the Dark Water Designs cart. I picked up the flirty fringe top, and a cute jogger set. Keep reading for the details! This pretty halter top with the rose appliques and the fringe was too cute to pass up at the Dark Water Designs cart. It comes in one other color (sold separately). It also fits really well, and comes in many mesh sizes. There is also an alpha layer included with this top so it is suitable for classic avatars. The other item I picked up at the Dark Water Designs cart, and I’m glad I did, is this “Cute” jogger set. The set includes the hooded jacket and matching jogger style pants in pink and black. This two-piece outfit comes in several mesh sizes, and the jacket and pants can also be worn separately. Additionally there are alpha layers for the jacket and pants so they can be worn by classic avatars. I love the detail in the lettering across the back. It really is very cute! Categories: classic avatar, events, fitted mesh, gacha, mesh, outerwear, pants, shirt | Tags: $10 Linden, 10L, Alpha Layers, Belleza Freya, Belleza Isis, Belleza Venus, Black and Pink, Cart Sale, Cart Sale at The Wash, Catwa, Catwa Gwen, cheapies, cute, Dark Water Designs, Dark Water Designs Cart Sale, DWD, eBody, enVOGUE, enVOGUE Hair, Essences, Essences Digby, fab free, Fab Free in SL, fabfree, fabfree in sl, fabulously free in SL, fashion, Fashion in SL, female fashion, Freebie Blog, Fringe Halter, Jogger Set, Maitreya Lara, Non Mesh Avatars, Ocacin, Prudence Rexroth, Second Life, second life blog, Signature Poses, sl, sl freebie blog, Slink Hourglass, Slink Physique, standard mesh sizes, The Cart Sale, The Mesh Project, the wash, TMP, Tonic Curvy, Tonic Fine, tres blah, TRUTH, Truth Hair, [ROC] | Permalink. Hello Fab Free’rs! I hope you had a wonderful weekend. Is it too early to be thinking about Valentine’s Day? I’m not sure if it’s all the Valentine’s Day stuff I’m already seeing in stores or what but I saw this cute dress by Envious and instantly wanted to wear it. I suppose it doesn’t have to be a Valentine’s Day only dress. Either way, it sure is cute with it’s Peter Pan style collar and little red hearts. Whether you save it for Valentine’s Day or wear it right away, at just 1 linden (no group needed) this sweet dress from Envious is well worth the effort. You’ll find it for sale among the current Envious group gifts. It comes in several mesh sizes and includes an alpha layer for Classic non-mesh avatars. Don’t miss out on this adorable dollarbie from Envious! Categories: dollarbie (1L-3L), dress, mesh | Tags: $1 linden, Absence, Alpha Layer, Belleza Freya, Belleza Isis, Belleza Venus, Catwa, Catwa Uma, cheapie, dollarbie, Dollarbie Dress, Dollarbie in SL, dollarbies, Envious, Envious Dollarbie, Essences, fab free, Fab Free in SL, fabfree, fabfree in sl, fabulously free in SL, hearts, Hearts Dress, Magika, Maitreya Lara, Prudence Rexroth, red, Second Life, second life dollarbie, Signature Poses, sl, Slink Hourglass, standard mesh sizes, TMP, V-Day, V-Day Dress, valentine's day, Valentine's Day Dress | Permalink.